Darrell W. Cook is an experienced Texas trial lawyer who founded the law firm January 1, 1994. Darrell W. Cook founded the Firm on January 1, 1994. Since then the firm’s focus has been on business and commercial litigation, including collections, employment disputes, complex business matters and landlord-tenant disputes. Darrell began his professional career as a Certified Public Accountant practicing with international accounting firms BDO Seidman and then Coopers & Lybrand. Darrell eventually taught accounting in the Cox School of Business as an adjunct professor. 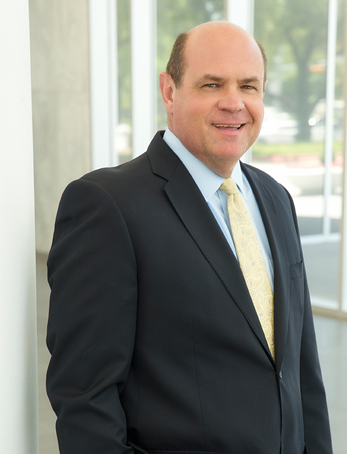 Darrell, a native Texan, graduated with a degree in Accounting from Oklahoma State University in 1982 and a law degree from Southern Methodist University in 1993. Representation of landlord seeking to enforce lease and landlord’s lien against large Internet company that was tenant. Tenant occupied two floors of large building. Locked tenant out of property. Sold assets. Representation of produce supplier that was not paid for produce supplied to restaurant. Sued restaurant owner for personal guaranty. Restaurant owner denied that he had signed guaranty. Judgment entered against restaurant owner for full amount sought plus attorney’s fees. Representation of lender against printing company. Obtained Temporary Restraining order and then temporary injunction prohibiting business owner from transferring assets. Also obtained order closing business. Assets eventually seized and sold. Owner of printing company filed for Bankruptcy. Sought and obtained order selling assets of owner to satisfy lender debt. Matter settled with debt paid in full out of proceeds from sale of owner’s assets. Representation of business broker that obtained a qualified buyer for business but transaction did not consummate. Brought suit against seller for failing to consummate transaction. After trial, judgment entered in favor of business broker for all sums sought, including attorney’s fees. Representation of holder of promissory note holder. Client obtained note from former spouse in consideration of paying for burial expenses of deceased child. Case tried before jury. Jury awarded verdict including debt sued upon and attorney’s fees. Representation of SBA lender against manufacturing company. Obtained Temporary Restraining Order prohibiting business owner from transferring assets. Also obtained order closing business. Assets eventually seized and sold. Representation of property owner of “B” Class property against the City of Irving that identified the properties owned by the client as occupied by Hispanics, a group considered undesirable by the City of Irving. Obtained a Temporary Restraining Order against the City of Irving and eventually settled the matter on terms very favorable to client. Prosecuted copyright infringement case against internet-based company that reproduced portions of client’s book on his site without permission. Matter settled on favorable terms. Obtained temporary restraining order prohibiting the City of Arlington from demolishing investment property. Matter settled on terms favorable to client. Removed fraudulently filed $1.3 billion lien on property valued at $2 million. Later obtained judgment against the filer for $1.8 million. Representation of property owner of “D” class property in successful resolution of temporary injunction suit brought by City of Dallas. Representation of Internet-based company in trademark infringement action brought in Dallas County. Representation of partner in security business against other partners that were diverting business. Obtained temporary restraining order and temporary injunction. Matter settled. Representation of lender against printing company. Obtained temporary restraining order and then temporary injunction prohibiting business owner from transferring assets. Assets eventually seized and sold. Owner of printing company filed for Bankruptcy. Sought and obtained order selling assets of owner to satisfy lender debt. Matter settled with debt paid in full out of proceeds from sale of owner’s assets. Representation of holder of judgment against debtor in case where debtor argued that the judgment was not valid. Case tried to a jury. Verdict in favor of our client on all counts and all relief requested was awarded. Representation of national health insurance company in collecting unpaid premiums on group health benefits against large employers. Representation of small business in dispute regarding labor provided, obtain judgment, execute on land owned by judgment debtor. Representation of individual defendants accused of failing to pay past debts resulting in counterclaims under the Deceptive Trade Practices Act and the Fair Debt Collection Act. Representation of debt collectors accused of violating the Deceptive Trade Practices Act and the Fair Debt Collections Practices Act. Representation of business broker that sold business. Suit was brought by business buyer for fraud, DTPA, etc. Case against client was dismissed by plaintiff after second day of jury trial. Representation of international hotel that was occupying property after termination of lease by landlord. Successfully worked to keep hotel in property an additional 17 months after receipt of notice to vacate. Representation of construction company sued for negligence by school district for faulty construction. Suit eventually dismissed against client on the eve of trial. Representation of buyer of business that discovered seller of business had misrepresented the environmental condition of the business. The business was purchased using funds borrowed from a bank and seller-financing. Case settled for forgiveness of the entire seller-financed obligation.